Skype Numerology: 50 million concurrent users online ! I will publish here my thoughts about Skype, and mainly about the "numbers". Indeed, as a first hour user, since almost the beginning of the exponential growth i tried to register some data about it. I published in the past as a Guest Blogger in Skype Journal and Skype News some graphs and comments and will continue this here. English isn't my mother tongue: corrections are highly appreciated! 50 million concurrent users online ! Today, Skype crossed the 49 million AND the 50 million marks of concurrent users online ! More mobile devices, the MSN integration and the let’s not forget the natural growth of users worldwide! This means that one out of each 140 people in the World was online at the same moment (if we forget multiple accounts of one user – I had two running!). On September 5, 2003 there were "only" 44,444 people online at some moment of that day (I don’t have the hour)! Hi Jean. I do that, this week. Greetings O. Kuhn. 1- Do every dot represent a snapshot of the number of online users at a given time every week/day? 2- I would like with your permission to use the graph you have prepared here. is this OK and if so how? 3- Would it also be possible (still referring to your work) to get the data for visualization in a slightly different format? Please contact me at my Google account if you need to. Question 2 & 3: probably yes if you give me an explanation "why" and tell me something more about you. You can e-mail me at the mail address of my (outdated) professional website. hey can you provide me the number of skype accounts in Mexico. I registered a Skype account on September 26, 2003. Bit by bit I became a fanatic user, helping other users on the Skype Forum. From one thing came another, and Skype made me "Super User" on their forum, some kind of recognition for all the help I provided (to be honest, I am not that active anymore). 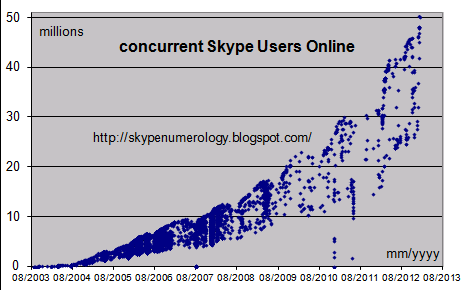 And, I also began to collect data on the growth of Skype. In real life I am a management consultant. Download speed of Skype client accelerating! And, 48 million people online today! 47 million on a Sunday, first time ever!